Sebastian Fiedler is busy trying to organize a BlogWalk meeting in Innsbruck on June 25th 2005. This on the day after the Microlearning Conference in the same city, which takes place on June 23rd and 24th. 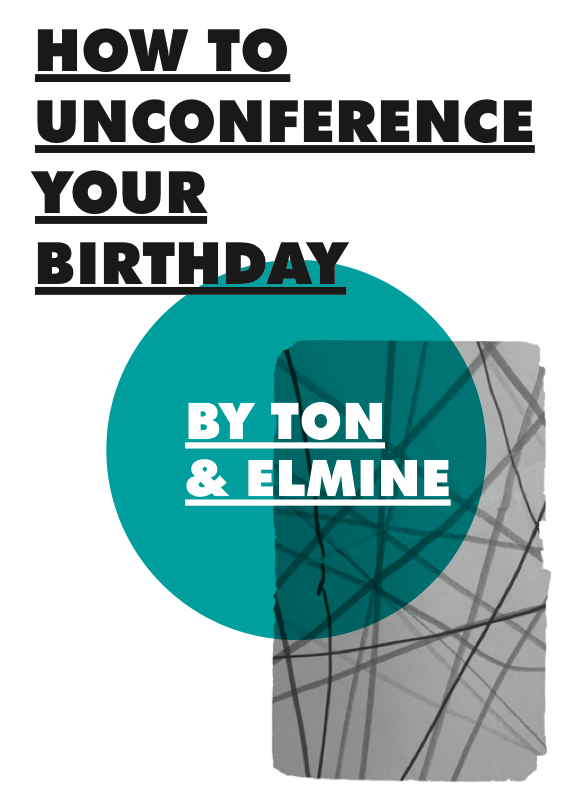 It certainly looks like a great conference also from a KM and social software viewpoint. Are you going to the Microlearning conference, and would you be interested in participating in a BlogWalk meeting? Let me know, so we can let you know early enough what will happen, so that you can take it into account when making travel plans. It is our pleasure to announce the next BlogWalk meeting! On May 20th BlogWalk 7 will take place in Mechelen. Tom de Bruijne, Maarten Schenk en Clo Willaerts have kindly agreed to be our local hosts. The theme will be civic journalism. BlogWalks are by invitation only, and the number of available places is limited. We are sending out invitations in the coming days. E-mail me if you’re interested to attend; usually we can fit all those who are interested. In the latest issue of Global Knowledge Review, the magazine by David Gurteen and Bizmedia bringing you KM practices from around the world, I contributed an article on BlogWalk. The full text of the article, titled Hosting Grassroots Conversation Between Knowledge Activists, is available from David Gurteen’s website. Basically the article talks about how conferences don’t provide the environment to interact with others the way I want, and how that frustration turned into BlogWalk. That creating the right environment for meaningfull conversation ourselves was an expression of taking responsibility for our own actions. And that being able to create such an environment yourself might well be a critical skill in a knowledge economy. By the way, the results of these BlogWalks, such as the one held yesterday in Chicago, are aggregated on the Blogwalk Topicexchange channel, and in the BlogWalk Wiki. There are days when you would rather be somewhere else. Today I would have liked to be in Chicago, attending BlogWalk. But one can’t go everywhere all the time, and budgets have limits, at least mine do. Today saw BlogWalk 6 in snowy Chicago. Not everybody could make it, according to AKMA, who blogged some live impressions. Krista Kennedy and Judith Meskill had to cancel, but Phil Wolff decided to attend last minute. Topic today was a rerun of our London session, on social software in organisational settings. Lilia Efimova is representing both Sebastian and me, and I am glad to see that some characteristic features of previous sessions got transplanted across the Atlantic, such as the Windows Wiki (post-its on the window). Other traditions, such as the walk, got adapted to local circumstances: an impromptu snow ball fight.AKMA posted pictures in his Flickr stream, from which I copied a few shots. I am looking forward to reading more blogpostings in the coming hours/days. Stuart Henshall reflects on how he will move away from ‘traditional’ blogging in the coming year. This triggered some comments by me in his blog, but also this longish post, which is largely unorganized thoughts and assocations. Just a first step in sensemaking. I’m seeing signs that blogs are declining in usefulness and utility as they are pushed into activities they are not suited for. […] Going Blogging was one of the most rewarding things I’ve done in the last few years. It has connected me with wonderful people all over the world. It’s brokered many a new introduction. Still I’m planning on giving up my blog in the new year. I’m migrating away from being just a blogger. A lot of what Stuart says rings true to my ears. I have seen my blogpostings become less frequent, in my mind as a result of spending a lot of time and energy in what Johnnie Moore calls the in-between spaces. In relationships, in collaboration etc. However this has been largely blog-induced. Blogs are great to think out loud and thus to trigger new conversations and relationships. That’s why I think Elmine Wijnia’s communicative definition of weblogs is hitting the nail on the head. Blogs are far less effective though in feeding and sustaining those relationships and collaboration it helped trigger, except as placeholders at which they are very good again. This is a point Denham Grey is repeatedly making. Stuart says Blogs remain static in structure, they haven’t evolved much. I think I recognize what he means. Blogs not only give individuals a voice, but by the sheer number of them can also put people at a distance. Stuart notes I think that the large number of blogfeeds together form a filter, my community filter, of what is going on and what is thought to be important. Then not the individual posting as such draws my attention but the aggregate patterns I see in the info-soup. (See also Every Signal Starts out as Noise) The fact that individual bloggers to me are not only worthwile as conversational partners themselves, but also parts in the Early Warning System their collective rss-feeds form, is not something that is reflected in our blogs. Blogs haven’t adapted to their new additional role as aggregating piece of a wider filter/pattern. This brings us back I think to an earlier conversation on blogs as Personal Presence Portals. We have started our blogs as soapboxes, triggering conversations, which turned into relations and collaboration. At the same time your blogs created new horizons for me, making me aware of much more events, information and stuff than before. Putting all that together created a new filter to view the world with (and made magazine and paper subscriptions superfluous for me). If our blogs need to evolve than this should be in two directions I think. The first direction to serve us better on an individual level, the second to serve us better as part of the aggregate filter, as pixel in the pattern. One direction is to enhance value on a personal level, creating loads of more context. Not by only being an outlet channel for thoughts, but the on-line hub of my life. This could mean (more) integration with my other personal information tools (think private and public wiki, yasns), providing not only personal intellectual context (books I read etc. ), but especially more social context. I feel my blogroll does not serve my purpose as an indicator of my network well. So being able to share information about my networks (localized yasn? Feeds from LinkedIn, OpenBC?) would be an option. But once I share that, I want to be able to determine who sees what on my blog. My network consists of circles, with different shades of intimacy and trust. I want the access someone has to my blog to reflect that, much like real online portals are able to do (or forums with their reputation systems for instance). If I work with you, our work should be accessible through my blog/wiki. Others should only be able to see what we want to share about it (nothing, the fact that we collaborate, some of the results, some of the work, everything). Also access to multiple communication channels falls into this category. Or I could think of things like a section “people I have been in touch with today”, showing us more of the in-between spaces. Another route for evolution, to satisfy the role as filtering part of the whole, would be turning to microcontent a la Marc Canter more (who by the way talks of digital life style aggregators in the same way I think of presence portals). If I am part of your community filter, I should think about how to feed that filter better and more effectively. Only part of what I filter myself becomes visible in my blog. As I write this, dozens of links/articles/pages come to mind, which I won’t all mention, but are nevertheless important. You could benefit if I had a channel where I did open them up for you. Martin Roell’s Newsfeed sort of serves that purpose I think. De.licio.us, my bookmarks feed (rss), does as well. How about if I opened up those feeds right in my blog, adding the wiki-changes, feeds of comments I made elsewhere, etc. Or all the feeds I read myself. There is no need here for me to organize all those different info-particles or make some sense of them, just a need to show you which info-particles I encounter and pick up. It’s about leaving trails really, as Steven Johnson writes in his book Emergence. So how feed the filter more? By supplying additional feeds, but also perhaps by supplying additional blogs/content streams. I write about Knowledge Management, but also (fledgingly) about alternate energy sources. A more traditional life-log could add perspective (especially if geo-tagged). Where have I been, what did I do, and not restrict it to the topic at hand (knowledge management in this case). It is through this type of info that things go click, in my mind at least, which helps me connect the dots. Stuart said his blog would have been more succesfull if it had had more focus. 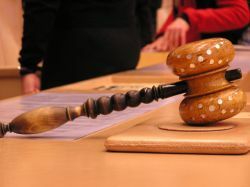 Even though I don’t know what success in this case means, I am suggesting that for my blog to be a usefull part of your community filter it would need less focus. Or at least, different foci in different sections of my blog as personal presence portal. Important here would be to open up this stuff to you in a non-time consuming way. I don’t want to write down the trails to feed into your filter, they need to be able to write themselves down. The first thing that comes to mind is evaluating my current blog. What info is on there, and what role does it serve. Uncluttering the blog, and then recluttering it purposefully, you might say. A second step would be moving more traces into view, and add pointers to other foci. Change feeds for the wiki (or different wiki’s I am active in) and that sort of stuff. It is our pleasure to announce a new edition of BlogWalk, the salon-like get togethers Sebastian Fiedler, Lilia Efimova and I are organizing. In cooperation with Jack Vinson, our local host (thanks Jack! ), we are in the process of organizing BlogWalk 6 in Chicago, United States. Lilia Efimova will be in the US and attend the BlogWalk. We’re hoping Seabury, Evanston IL (see picture), near Chicago, on the shores of Lake Michigan, though we don’t know for sure yet. Social software in corporate settings. We are continuing the discussions started during BlogWalk London last September, and are curious if a North-American perspective yields different insights. Blogwalks are by invitation only. If you have an interest in attending please let us know, so we can invite you. There is room for about 25 people. Get in touch with me (e-mail on the left hand side), or better yet, with Jack Vinson directly. For more information have a look at the BlogWalk wiki. We are also looking into organizing a new BlogWalk session soon in Europe as well. The theme for the fifth Blogwalk in Umea was “Blogging on the Move”. It was loosely inspired by the fact that Howard Rheingold gave a seminar and workshop before the Blogwalk on SmartMobs and the effects of mobile devices on our behaviour. A second reason was that it required a lot of mobility to get to Umea, far up north in Sweden as it is. We were only a small group of people but that enabled us to get deeper into the discussions as a group, and also to get some stuff done. We started off with the thought that moblogging in itself might not be the real issue. Or to paraphrase Martin “I’m not a moblogger, I’m a travelling blogger having trouble getting connected”. I think we can paraphrase this for mobile knowledge workers as well. It’s not about mobility for the sake of mobility, it is about being able to take as much of your normal working and learning environment with you when you are on the move. Stephanie raised the question of the requirements on tools for moblogging. Her experiences with live blogging at the JokkMokk festival (pdf), with batteries dying because of the cold etc, taught her that we need more robust tools than the fragile laptops for instance we were using during the Blogwalk session. I also suggested the mobility between tools as a topic. To me flow between tools is more than just having access to the internet. I need my phone, laptop, pda, and especially the software that is available on them to be able to work seamlessly together or having connectivity is still largely of no use. (For instance I blogged once from a public terminal at the Vienna airport, which was largely useless because I did not have access to my laptop at the time). And who needs it? Probably everyone who gets into situations where creativity/innovative solutions are required, which is an increasing number of people in our post-industrialist societies. The most asked question when I speak to people who don’t blog, is where I get the time to do it. This seems like a list of things that apply to a lot more situations than just blogging. For instance we compared it to Stephanie’s experiences when she first moved from the US to Sweden, and had to find her rhythm in a new country. It also resonates with my own perception that the time I spend blogging is either not very large, or all of the time. Reading blogs, writing to reflect and digest, writing to collect and gather, and sharing along different channels (blog, wiki, company portal, e-mails, etc.) is just the way how I collect and process my personal information flow. Asking me how much time I spend blogging, is treating blogging as an additional activity in my life (which it was at first), and feels to me like asking how much of my time I spend breathing. In short, to me this has to do with the ability to keep up flow, and to maintain the richness of your context, whereever you are. This also helps to decide when you do not need connectivity: at the points where you are consciously breaking flow, like during holidays, breaks etc. Like switching of my cell phone during lunch so I can talk to my friends uninterrupted for a bit. Tools need to be convenient in size, weight, price and robustness (weather, temperature, dust, water). Size is probably always a trade-off with useability, and there is a marked difference I think in when it is handy to take along a laptop, and when I need a handheld mobile device with small screen. At the end of our session Lilia joined us on Skype, and that led to some observations as well. On-line joining in the middle creates some awkwardness. I had the inkling to start summarizing what we had been doing in the session, which wasn’t a usefull idea. Lilia made remarks about how we did not introduce ourselves but started talking to her directly and she had to try and recognize our voices, as she could not see our faces. Both things are probably due to the fact that she knew most of us already. So we started talking from our shared level of trust. If it had been a stranger I probably would not have felt the need to summarize, and would have taken the time to say who I was. Next to the seminar and reception with Howard Rheingold we enjoyed last Thursday afternoon we also joined a more small scale workshop with Howard Rheingold on Friday morning. Our little Blogwalk group made up about half of the audience I think. In a group conversation setting we discussed several topics. One of the more interesting things to me was when Howard Rheingold showed us the tools he uses in his personal information strategy. For the bloggers in the room there really were not many surprises. RSS, BlogLines, Del.icio.us, all with actual screenshots, came up. He stresses weblogs as his community filters for information. Most people I talk to blogs about seem to think they’re publications, sources next to other sources like papers, where I see them as conversations. Howard spends some 4 hours in the morning engaging with his on-line community and sources of information, after which he spends the afernoon writing. He does keep an eye on IM and e-mail in the afternoon though. What struck me is how little we actually talk about our info-strategies, and info-diet, and the tools we use for it. Especially tools can be almost a secret thing in organisations that have rigid rules to what people are allowed to use on their desk- and laptops. My laptop is stuffed with different tools, most of them Open Source or freeware, that did not come with the pre-installed proprietary environment. My company is ok with it, but does not expect me to ask for support on the stuff I install myself. If my colleagues are convinced of the value of a tool, it will be added to the standard provided and serviced mix of tools we use however. Talking about how we do things, hunt and gather info, filter stuff, feed it into our workflow, pick the relevant items to act upon etc. is something we should do a lot more I think. Anyone who wants to compare notes? Thursday, after a pleasant early morning flight from Stockholm to Umea where Stephanie Hendrick met us at the airport, we enjoyed an afternoon seminar with Howard Rheingold. 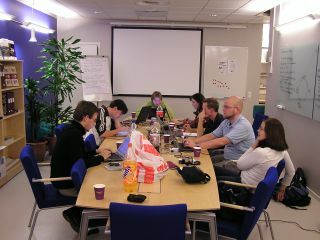 The seminar was organized by the Humanities Lab (HumLab) of Umea University. The HumLab provided a great space, a cross between a high tech laboratory and welcoming living room, it lured everyone into pleasant and interesting conversation immediately. in 2000 he was in Tokyo and saw how 1 in 4 on the sidewalks was looking at their phones. in 2000 he saw in Finland how youths were looking at their phones, smiling, showing eachother stuff, even while in conversation with older people at the same time. A parallel event seemed to take place. in the Phillipines within hours after the government seemed to censor tv transmission about impeachment hearings of the president, thousands of people showed up on a central square in black clothes. Not by central organization but by sms-ing eachother. The interesting thing to Howard Rheingold was that everywhere he went he saw these new phenomena and heard it describe in the same words. Metaphors like birds flocking to seemingly random places, to suddenly move on again. He then realised that mobile phones were growing into multifunctional and multimedia devices, text, speech, and internet and camera turned it into hybrid devices. This enabled what his colleague described as Collective Action. When the devices are widely distributed so will the uses. People will create applications fitting their needs. Tim Berners Lee did not need permission to create the Web, he just wrote something that was useful to him, and as it turned out to a lot of others. When thinking about how this stuff will have influence, also think about projects already using distributed calculating power, like SETI or the Folding Project (http://folding.stanford.edu). Add location awareness (geotagging, RFID) to the mix, with millions and millions of RFID chips being spread around the world. Barcodes are an advance warning, of what can happen with these chips permeating the environment, certainly if combined with e.g. Google searches. Rheingold rightly warns about that none of this technology is intrinsically good. It can be used both for good and for bad. He points out that the violent riots surrounding the Miss World pageant in Nigeria were also the result of SMS-based communication. In the Q&A session several interesting things came up. What will be the information containers of tommorrow? Where to store all our information is indeed an interesting question. There are basically three containers involved, the cloud of internet, storage devices and our heads. How much cognitive overhead can you deal with to keep track of all those info-containers. Will we cope? Howard Rheingold seemed uncertain, or as he said he may be too old, but I think we will adapt. Information overload does not exist. Collective action also in the past changed things rapidly. Collective hunting drove bigger mammals into extinction quickly, agriculture made possible cities and empires, which in turn required administration. Writing exploded because of it, being followed by the printing press etc. It is a continuous process of acceleration. He wonders if we will keep up. I think we will, or at least the younger generations will. Institutions change slowly, only when the old people die Continuing this thought by the way would confirm my own intuition that the current ageing of the workforce, and the imminent retirement of large parts of the workforce in Europe can be an enormous catalyst for change and innovation. Howard Rheingold sees huge potential for virtual ways of dealing with information, as opposed to more tangible stuff like books etc. He uses the word co-evolution. It reminds me of Dennet’s book about evolution where he explains culture as a realm accelerating our evolution because we can change and adapt without having to change our physical lay-out. The virtual world is a place within culture where even more acceleration is possible. He points to India and China where two billion people are on the brink of adding their creativity to that mix. All in all a very worthwile afternoon, even though much of what Rheingold talked about wasn’t new, at least not to my ears. He did add different perspectives though, and hearing your own observations and suspicions put into words by others helps to reflect on them better. During the small scale reception afterwards, to which we were luckily invited by Patrick, head of HumLab we had plenty time to talk to the people of HumLab and Howard Rheingold in person, continuing on the themes of his earlier presentation. Howard Rheingold seemed interested in the concept of our Blogwalks, as it too is a collective action from distributed agents. Next entries will go into the workshop with Howard Rheingold on Friday morning and the Blogwalk meeting on Friday afternoon. During one of my first philosophy courses we talked about different systems of government, and how they deal with power. Democracy is different from other forms because the place where the power is, is empty. There is no person or object that embodies the power. People just pass through the place of power, objects lose their symbolic significance when not used. Everyone knows the emperor has no clothes, but that doesn’t hurt at all, simply because there is no emperor to begin with. Today we saw that demonstrated before our eyes.When we walked through Stockholm today we passed the Parliament and saw a poster indicating that today was open house. We entered the building on a spur and within minutes we stood in the plenary room, playing around with the Speakers hammer. 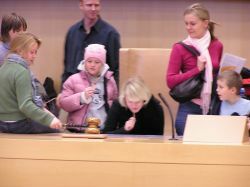 Children were playing Speaker, their parents taking pictures. A couple had themselves photographed making out between the MP’s benches. How different from the struggle to fill the void Yasser Arafat left behind when he lay dying in a Paris hospital. Or can you imagine two random teenagers walking in from the street having themselves pictured kissing in the Oval Office or in the US Senate speaker’s chair? In the rooms around the plenary hall different parliamentary commissions actively engaged citizens into conversation about different topics. We chatted briefly with MP Ingvar Svensson about Sweden’s place in the EU and how the people rejected the Euro in a referendum. 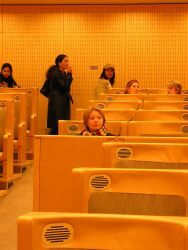 After having a look in the former plenary room, we left and continued on our way. The Swedish sovereign power not the least tainted by the fact that we played around with it’s symbols for a while. 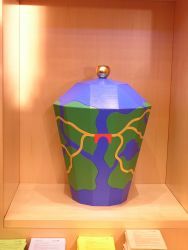 The urn used in Swedish Parliament for personal secret ballots. Note how this important artefact is a playfull object of art, depicting the islands on which Stockholm is build, with the Parliament as the red bridge. The Kingdom’s golden apple on top. In Umea, enjoying a seminar, workshop and conversations with Howard Rheingold, and now having a BlogWalk session reflecting on it. With pleasure we announce the fifth BlogWalk meeting! Date: November 11th (afternoon) and November 12th (whole day). On Thursday November 11th, all BlogWalk participants are invited to join a seminar by Howard Rheingold, which starts at 15:00 at Umea University. Friday, November 12th will be spent with a BlogWalk meeting. Place: Umea University, Sweden. Stephanie Hendrick kindly invited us to her hometown and university. She presented at the BlogTalk conference and took part in July’s BlogWalk in Vienna. Umea lies on the Botnian Gulf, 8hrs by car north of Stockholm. Flights from Stockholm fly regularly and will bring you to Umea in an hour. Also there is a night train. Umea is the site where in the 19th century Swedish troops last fought on Swedish soil (against Russian troops). Theme: Blogging on the Move. In spirit with the interests and publications of Howard Rheingold this BlogWalk will focus on mobility, and it’s meaning for far flung communities and networks. As always both the Howard Rheingold seminar and the BlogWalk meeting are free of charge. A small contribution for coffee and refreshments probably will be asked. See you in Sweden? More info will soon be posted on the BlogWalk website. Preparations for the meeting can soon be found at the new BlogWalk wiki. [Addendum]: Also if you know someone who you think might enjoy joining us, please let us know. Our aim is to bring a diverse and interesting group together, mixing familiar and new faces. Tomorrow the fourth BlogWalk meeting will take place, this time in the heart of London. Johnnie Moore helped us out as the man on the ground this time. Thanks! It will be strange tomorrow, as for the first time I will not be attending the BlogWalk myself, even though I helped organize it. Just couldn’t make it. But the next one is already taking shape. We’ll be visiting Umea in Sweden, on the kind invitation of Stephanie Hendrick. 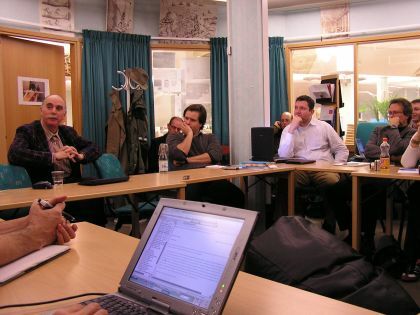 On November 11th Howard Rheingold will hold a seminar in Umea, and the day after that the seminar will serve as input for our fifth blogwalk meeting. Definitely going to be there! I am sure they will have great conversations and that we’ll be reading their aggregated reflections at Topicexchange. Interested in attending a BlogWalk meeting? All meetings are by invitation only. But invitations are not hard to come by. Just get in touch with me (or Lilia Efimova or Sebastian Fiedler) and show your interest. The third blogwalk meeting, about weblog networks, went well. It was different from the last two times: more people, less overlap in who knew eachother before. A number of people signed up for the meeting at the last moment, but that worked out nicely too. The meeting was sort of a warm-up for BlogTalk the two-day conference. This had the effect that the group was more international, with some North Americans attending as well. We took more time getting to know each other, and thus the first part the day was less focussed than I had expected. Nevertheless the group seemd to need it so I tried not to interfere much in my moderating/facilitating role, and just go with the flow. Lunch, the afternoon walk (for both of which Siegfried joined us) was good after which we continued at the venue again. We rounded off with a group discussion which helped a lot in making the earlier conversations more concrete and create more explicit questions and answers. Getting from ideas to action in bloggers-networks might be difficult in part because it is a phase-transition of sorts from emergent pattern forming towards planned and controlled execution of steps. Blogs certainly aren’t made for the latter, and although we integrate multiple channels of communication in our blogs already we aren’t quite used to make that switch, at least not seemless. That is can be done of course is proven by BlogWalk itself. Also network forming might benefit from being able to determine in a more nuanced way what is public and what is more private/closed. This now to a large extent is a binary thing. It’s all in the open, or shielded behind the firewall. Being able to define different levels of publicness or privacy might be a step towards helping facilitate the phase-shift mentioned above. One action also came out of this blognetwork-get-together. Piers Young (thanks for coming Piers! ), Lilia Efimova and I decided to start a little work on personal knowledge management. I am looking forward to get going with that. Martin Roell and I at the end of the meeting had a little chat on the balcony and found that we were somewhat disappointed by the (lack of) outcome. I think we were expecting a bit too much, and also spoilt by the previous meetings, especially the first one in Enschede where we got into very deep discussions from the get-go. Also we, illogically, expected to be able to continue and build upon earlier BlogWalk conversations and results. That of course was impossible, as this was a different group altogehter. During a pleasant conversation with Lee Bryant the next day over beers, he proposed that if you want to create that effect it might be a good idea to do some pre- and post-discussion and also try and capture more of the results from the discussions. Create artefacts as it were, so that we leave trails of our efforts. I will certainly spend some time thinking about that in the coming weeks, as this is also important to the question how we want to continue on as a series. Not all meetings can be arranged like this by Lilia, Sebastian and me. All in all a great day. We had positive feedback of a lot of the participants, and Markus Breuer made my day, as Eric Ras did in Nuremberg, by saying that it was an extremely informal day that however took very intense concentration all the time. That is precisely what I like these BlogWalks to be. Informal, but very much challenging and inspiring. A slew of people to add to the feed reader! A visit by Flemming Funch who moved to Toulouse in France from the US, working from home for clients a continent away. An e-mail from a former co-student telling me he has moved from urban California to rural Normandy while still working for the same Californian employer. Reading Emergence by Steven Johnson, a gift of Jon Husband. Cities are concentrations of people first, and because of that concentrations of relationships, networks, goods, production facilities, commodities, capital, ideas, novelties, news, information, knowledge, cultural activities, well the list goes on. For as long as there have been cities there has been a pull on people to move there, and by now more people live in cities than in the countryside that produces their food. In cities you are more likely to come across people who can help you realize a novel idea, more generators of ideas, and more who can finance your innovative endeavours. In terms of aspects of Emergence (Johnson, 2002) this connects to more and longer traces, more is different, and the ability to watch more neighbours than in a rural village. Cities are hubs in information and knowledge flows, as well as the cradle of emergence. Johson goes as far as stating that cities could be seen as a superorganism, with us as it’s unaware cells. Much like the aggregation of slime mold cells into one entity. Most of us cybersavvy people out here in the blogosphere, used to navigating the enormous amounts of information that are available to us, are citydwellers as well. However I also see people removing themselves from that picture somewhat. Flemming moved to France, not to rural France to be sure (Toulouse can hardly be called a quaint little village), but he did remove him and his family from their US life, while keeping up his economic connection to his previous place of living. My former co-student really lives out in the countryside. Celtic menhirs are more numerous where he now lives than neighbours. He still works for a California based firm however. They have not withdrawn themselves from the city-life they were leading before. Their on-line interactions, and their connectivity enables them to continue the best of their former lifestyle with the best the rural areas have to offer. Preventing peace and quiet turning into boredom and apathy. I myself look for ideas, co-thinkers, sounding boards and conversational partners in the blogosphere. I talk to Martin Roell for instance on an almost day to day basis, while I don’t really know who my nextdoor neighbour is. And the conversations Martin and I have are way more important to me than I can imagine having with the guy next door. So I too, am having part of my communication needs fulfilled on-line in stead of by the city I live in, and where I would traditionally have looked for it. If we can move aspects of citylive on-line, what would it take to move all of what we look for in cities into cyberspace? Ever since Cyberspace started 36 years ago in 1968 when military and scientific pioneers put up the first structures of a Cyberhicktown called Arpanet by connecting their computers, the number of inhabitants has increased steadily. I made my first travels there in 1988, and permanently took up residence in 1991 or so, before Tim Berners Lee turned the net into Boomtown by giving us the navigable web. Meanwhile I feel a growing need to be permanently connected. My always on DSL connection is no longer enough. It doesn’t help me on the road, nor in other places than my own house. WiFi and the interplay between my laptop and my cellphone isn’t quite as good yet as I would wish for. Also the seemless switching from one medium in the mix at my disposal to another is of growing importance. 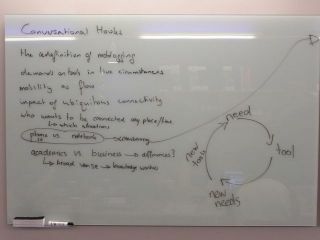 This all has to do with facilitating me as a knowledge worker, with giving me presence. 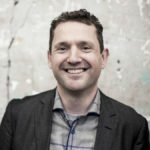 It is the combination of the two things Dave Pollard marks as the most important trends in Knowledge Management: connectivity and personal knowledge management. I have a feeling that that is exactly what I have to perfect myself in, to be able to become a full citizen of a Cybercity. What elements do we need to make a City in Cyberspace? In Small Pieces Loosely Joined (Weinberger, 2002) David Weinberger lists how different concepts work out on the web, and we can find parallels for that in cities. (Those concepts were, place, time, perfection, togetherness, knowledge, matter and hope) Most obviously for place, perfection, and togetherness. Johnson in Emergence adds to that what is for the most part still missing, mainly feedback. What would help is two-way links (nearness is based on links, links are based on interest), which would make the end point of a current link as near to the originating site as the target site is now viewed from the source-site. What is missing in the current Cyberspace, to be able to turn it into ‘real’ city-life? The red light district is well established, now even with tools that turn manipulations of another person into physical sensations by letting these tools be remotely controlled through your internet connection. Coffeehouses for conversation (portals, fora), libraries, livingrooms/frontporches (blogs), neighbourhoods emerge (blognetworks), and work shops (wiki’s) are there as well, as are of course the shops and the auction houses. There are tribes and nations of people living alongside eachother, not necessarily mingling. Crime is there, scam artists, Nigerian and otherwise. But how many of us go to the theater on-line? I watch tv shows on-line, when available from public broadcasting websites here in the Netherlands, and the BBC. On-line stand up comedians? Fishmarkets? Harbours? Monuments? Old and new architecture? Heroes, villains? In general there is an enormous amount of information coming at you, just like when you first enter a larg city, the noise, the choice can be overwhelming. (dealing with informationoverload as learning to live in a new busy city?) The biggest problem is probably do we see the net as a whole or as a myriad of largely unrelated fragments. Most internet users experience fragments, or a vast sea of information to be consumed. Not nearly enough of us yet are there to shape the net to our own insights, as something to be produced. How many private persons run their own servers from home, how many of us are publishing stuff regularly on the net, thus creating ‘places’ of their own in the city they are in? We do it in our towns, decorating the front door, tending the garden, putting out the garbage for the cats to plunder. We shape our city as much as it shapes us. Until the the net is a two-way thing for most of it’s users, it will be like an empty city however, where loads of tourists come everyday to look around, shipped from sight/site to sight/site without knowing how one relates to the other, but nobody breathes life into it, with no real inhabitants that both create and feel it’s pulse. That is what the current state of the web is mostly like. Planning of cities doesn’t work very well, even if we try, but what micro actions can we take, in order to try and work towards this Cybercity where you and I could dwell in, travelling around the physical world for f2f meetings, withdrawing to a well connected village in between, doing our work on-line from wherever we are? Maybe we can draw on the ideas of emergence to answer that, in the light of Weinbergers characterization of the net? I have some inkling of what those micro-actions might be, but will save it for a next post, as this one is already pretty long. Your thoughts of course are welcome.